Heat oven to 425°F. Spray 15x10x1-inch pan with cooking spray. In medium bowl, toss potato, oil and salt to coat. Spread potato in half of pan. Bake 15 to 20 minutes or until potato is tender. Meanwhile, place flour on plate. In shallow dish, beat egg with fork. In another shallow dish, mix bread crumbs, seasoned salt and butter. Coat fillets with flour. Dip into egg; coat well with bread crumb mixture. Place fillets in other half of pan. Place zucchini over potatoes; toss to combine. Bake 10 to 12 minutes or until fish flakes easily with fork and vegetables are tender. 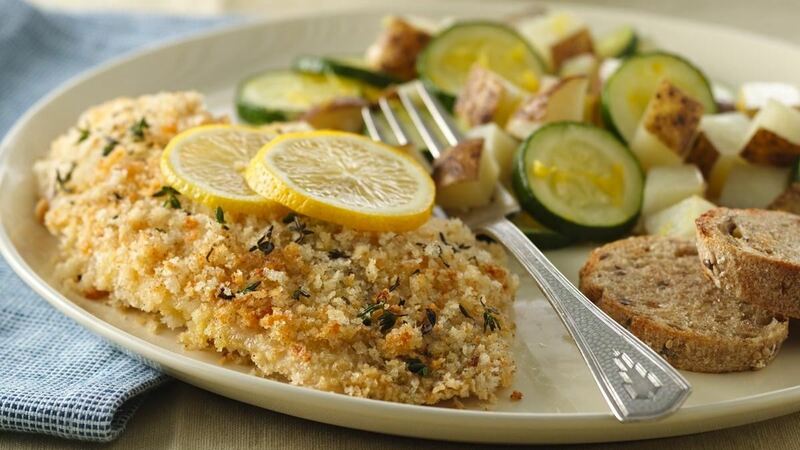 Sprinkle fish with thyme; toss vegetables with lemon peel.